Visiting Lago Di Braies is what made me first fall in love with the Dolomites. Can you believe I had lived less than 2-hours away from this stunning place for 8 years before I first discovered it. Although once I did, I was OBSESSED! I’ve since been back and seen it in every season, and it really is an enchanting place. As a local Lago di Braies photographer, I’m in the Dolomites multiple times a year. Not only have I discovered the best spots around the Dolomites for your adventure, I’m able to give you tips to make you whole trip unforgettable. 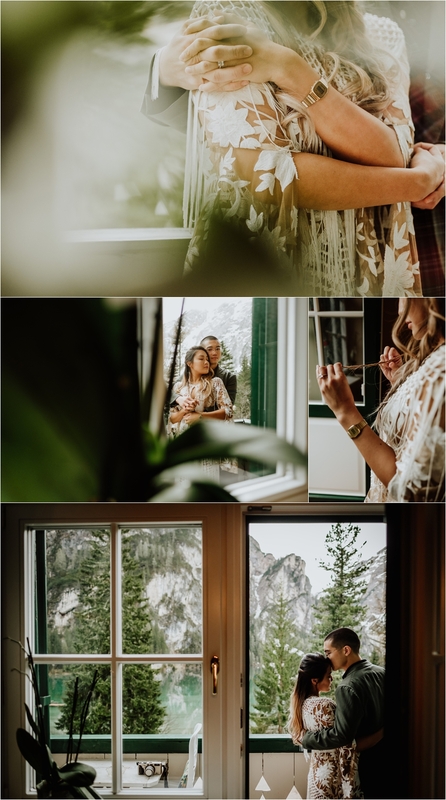 If you’re looking at visiting Lago di Braies or would like some recommendations of other breathtaking locations for your Dolomites elopement, then contact me today using the contact form below. Despite being in Italy, the closest airport to Lago di Braies / Pragser Wildsee is actually Innsbruck airport in Austria, which is a 2-hour drive. Although there is some public transport, getting around in the Dolomites is easiest with a car if you want to be able to explore more of the Dolomites, which is a pretty vast and varied region. During the winter months Lago di Braies freezes over and becomes covered in snow, which usually lasts until April. By May most of the snow is usually gone, the trails become clear again and the beautiful spring flowers start to bloom. If it’s your dream to see the beautiful turquoise waters of Lago di Braies, I definitely recommend coming between May and October. My name is Cat and I’m an adventure wedding and elopement photographer covering the Austrian Alps and the Dolomites. Based in Innsbruck in Austria, I’m just on the Italian border. My free time is spent hiking and exploring in the mountains, seeking out the best un-discovered locations for the perfect elopement in the Alps.